A BYRON Bay woman is coming to terms with the devastating news she will lose her toes after contracting a serious strain of malaria in Cambodia. Shelley Hill claims her Byron Bay doctor advised her not to take antimalarial medication, because it was dry season. 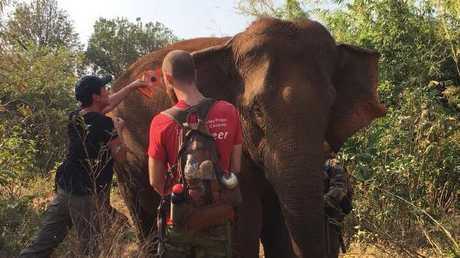 But when the 46-year-old returned from her trip, volunteering at a sanctuary for abused elephants, she began to feel unwell. Byron Bay local, Shelley Hill with elephants in Cambodia. Photo: Supplied. At first Ms Hill thought it was some kind of "Bali belly", from travelling in Southeast Asia, but after four days she called a home doctor. After another consultation and a blood test Ms Hill was diagnosed with malaria and rushed to the intensive care unit at the Tweed Heads Hospital. 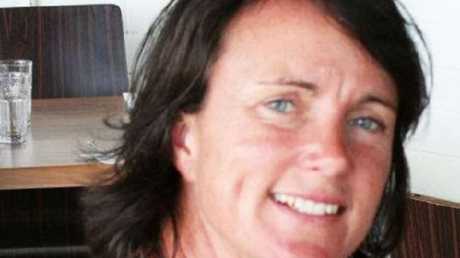 Close friend Mel Wilson, who rushed from Sydney to be at Ms Hill's bedside, said it was touch and go in the beginning. 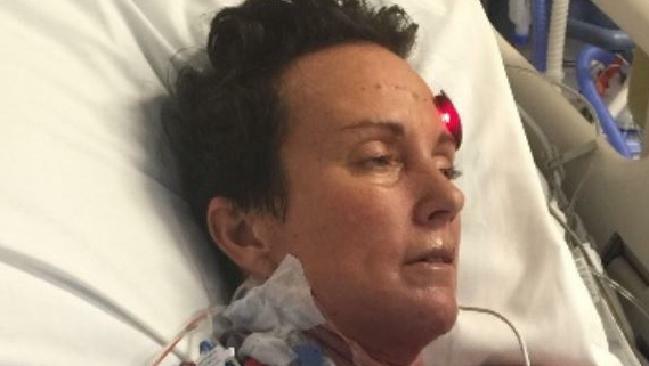 "In ICU, she was on life support or five days, we didn't know if she would make it ... but she is doing better since being transferred to the John Flynn Hospital at Tugun," she said. "It has been confirmed that she will lose her toes, but it remains to be seen what will happen with her fingers and hands. 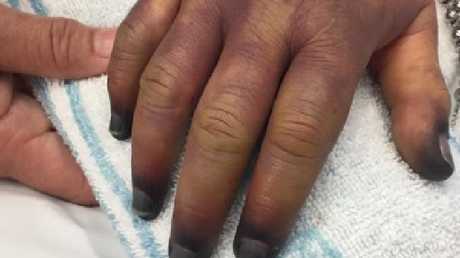 Shelley Hill risks losing her fingers, and possibly her whole hands, after contracting malaria in Cambodia. Photo: Supplied. "They are saying this week that she will have to be on permanent dialysis ... basically her life will never be the same. "The gravity of the situation has started to sink in for Shelley this week, she had a day when she was very down. "The next day she had picked up a bit, but it's going to be a long road ahead for her, physically and mentally. "She went to her doctor and took precautions, but was told she did not need to do anything about malaria ... a solicitor has been engaged." Ms Hill's friends and family have started a GoFund Me page, which has raised almost $50,000 in just eight days. "We want to alleviate the financial pressure for her, so she can focus on her recovery," she said. "For an avid gym-goer and runner, who may not be able to run again, it's a lot to take in. "She will be in hospital for months, there will be amputations, recoveries and rehabilitation. "We don't know yet how she will live, where she will live, or how she will cook dinner, or get dressed."